Stop by the shop and talk with us about our gear offerings from companies like AquaLung, Oceanic, Sherwood and Henderson. We have fun - We always have at least one contest for each trip, we are upbeat, and we love to laugh. Our trip leaders have been to each location in advance and have determined the food, accommodations, service and diving meet our standard to return with a group. We lead guided trips - We are there for you every step of the way. We will help you book the airlines, we will tell you what to pack, arrange airport transfers, meals, diving, and other activities. Sale and service of a full line of dive equipment from major manufacturers. Master Scuba Diver, Divemaster, Assistant Instructor and Instructor training. Trips to local and exotic locations that are perfect for diving. Flexible training options and schedules. The best prices on programs. Training and gear purchase incentives. Use of the only on-site pool in Central New York. 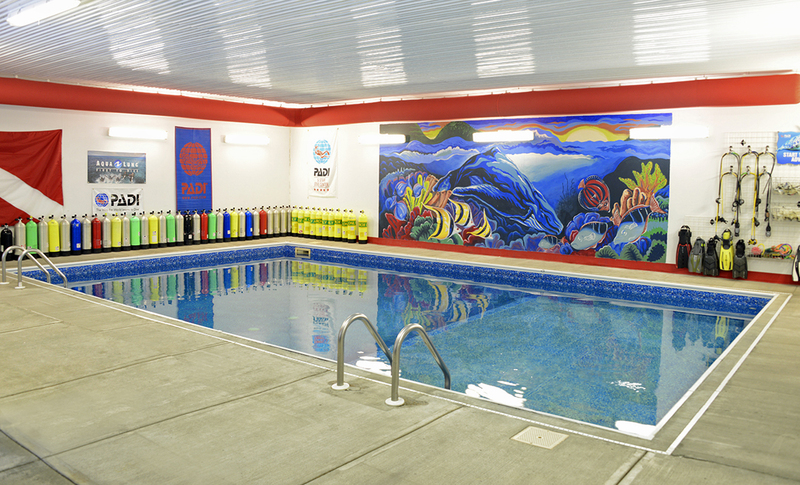 Because we're able to offer an on-site pool, training is always convenient, fun, and safe. You don't have to haul your gear all over town for classes, you get to enjoy more time in the water for practice, and you enjoy flexibility when it comes to scheduling. Additionally, you will have access to the pool after you get certified and purchase a life support package, so you can be sure to keep your diving skills sharp. Want to have a fun filled, exciting, stress free vacation? Let Aquatic World’s premier dive travel program handle all the details for you! You, your family, and friends just show up at the airport packed and ready to go! Our Travel Coordinator Sharon Corcoran (who is a highly experienced diver and has journeyed all over the world) handles all of the details. You’ll enjoy the trip of a lifetime, without the stress. If you're looking to learn how to dive in a safe, convenient, and positive atmosphere, you'll want to work with our PADI-certified training staff. We offer programs for people of all experience levels, from beginner to advanced. Our wide range of PADI (the most accepted name in dive certification) programs will leave you fully prepared for a new adventure. Once you're certified, trust Aquatic World to plan a once-in-a-lifetime dive trip that allows you to put your skills to use, while making long-lasting memories with other scuba diving enthusiasts. When it comes to scuba diving in Central New York, trust Aquatic World off Taft for all of your training, travel, and gear-related needs.